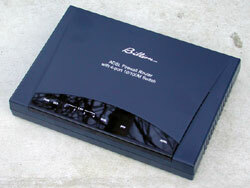 Nearly a year ago, I reviewed Billion's BIPAC-711CE ADSL modem. That was a good little unit and in the wake of that review became a popular choice for our readers and ADSL users elsewhere. 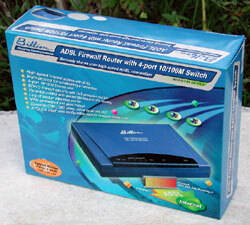 Recently, Billion have released two more ADSL modems. These aren't really aimed at superceding the 711CE, but instead expand the range with additional features. The 741GE V2 model, which we're looking at today, contains a 4-port 10/100 Ethernet switch. The 743GE model is similar but also has a built-in wireless hub, which lets your PC's or portable devices share your ADSL connection via 802.11b and WiFi. As explained in the 711CE review, to share your ADSL connection to several PC's you previously had to plug the 711CE into a separate Ethernet hub or switch, or use a net-sharing package on the PC that the 711CE was connected to. With the 741GE, you simply plug your PC's into the Ethernet ports on the back of the modem/router and away you go. If you DO already have an Ethernet hub or switch, you can plug that into the modem/router also, to allow a great many PC's to share your ADSL connection. You can use a straight-through or crossover cable, the modem will detect what you're using and respond appropriately. Inside the 741's nice shiny box we receive the modem/router itself, an Australian power supply, a small Quick Start Guide and a CD containing the full manual and some utilities. Two cables are also provided, the first being an Ethernet cable for connecting your PC to the modem/router, or for connecting the modem/router to your existing hub/switch. The second cable is for plugging the ADSL modem/router into your telephone line. There's also an ADSL Line Filter included, which is used to reduce the noise and errors on the line from another device that shares the same phone line as the ADSL modem. On the back from left to right we have the RJ-11 jack for connecting to the phone line, an RS232 female console port for connecting a terminal or PC serial port for managing/configuring the unit, the 4 RJ-45 Ethernet ports, a recessed Reset button for returning the unit to factory defaults, the power-supply jack and a push-button power switch. Note that there is no USB connection for this unit, unlike the 711CE. This means you must have either an existing Ethernet network or an Ethernet card in your PC to connect to this modem. However, it also means you don't need any drivers or special software to use the modem. Cheapy 100Mbit Ethernet cards can be had for as low as $15 at some computer markets, or you can pay a little more for one that will take more load off your CPU. On the blinkenlights front, I did find the status LEDs of the 741GE to be less helpful than the 711CE's. There's more of them, sure, but the lack of ADSL activity indicators is a bit disappointing. The ethernet lights change colour to indicate connection speed and flash to indicate activity, but all we get on the ADSL side of things is an 'ADSL' light which indicates you're connected to a DSLAM (the ADSL exchange at the other end) and a 'PPP' light when you have a PPPoA/PPPoE connection established. This doesn't tell you when the ADSL link is sending data or not though, which for basic connectivity troubleshooting can be handy. There's an email light - you configure the modem to check your mailbox for you and it turns an LED on when you have email. Maybe if you only get 2 or 3 emails a day and the modem sits on your desk then this might be useful to you, but for me it would be pretty much constantly illuminated and it's difficult to distinguish from all the other LEDs on the unit at a glance. Not to mention that the modem sits in a rack behind me! 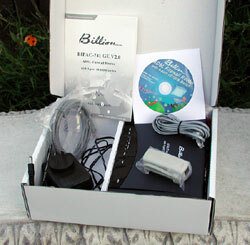 Billion seem to regularly update the firmware for their products, to add features and address problems. I found the firmware that shipped with this unit to be a little annoying in that it would time-out any idle TCP connections after 5 minutes. This isn't noticeable if you're surfing the web or grabbing your email, because that starts a new connection each time. It's also not a problem if you're playing games, because the game will keep the link busy. However, if you spend much of the day with an SSH window open like I do, it's frustrating to come back to the window after only a few minutes and find it unresponsive. I mentioned this to Billion and within days there was a new firmware available that extended that window to 30 minutes, with a configuration option to make it even longer. Flashing the modem with the new firmware is simple and is handled via a web browser using a simple form served to you by the modem.